Fry fish on both side till golden brown. Once fried remove from the pan and drain excess oil using a paper towel. Set aside. Using a wok or a deep frying pan brown ginger and garlic in cooking oil. Add water and simmer for a minute. Add pineapple juice and vinegar. Now add the ketchup, sugar, salt and ground pepper to taste. Simmer in low heat for 2 minutes. Start adding the carrots, bell pepper and onion. Add cornstarch, simmer for a minute, add fried fish, simmer for few minutes. Remove from heat. 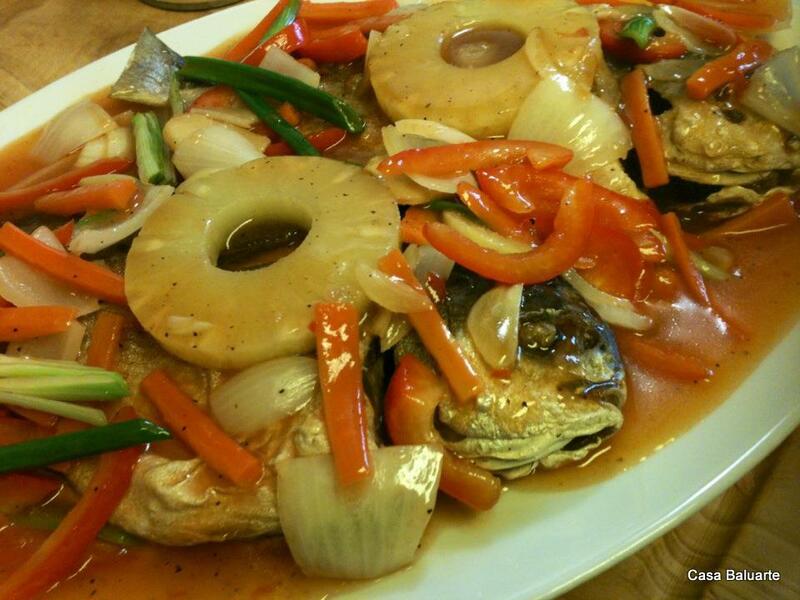 Arrange fish in the platter first then the veggies and the sauce. Garnish with pineapple slices and green onions. Serve and Enjoy!